MELBOURNE, FLA – Clevens Face and Body Specialists is proud to announce Dr. Vincent McGinniss is now board certified in Facial Plastic Surgery. In May, Dr. McGinniss completed his board certification examinations and was notified this month that he had met all requirements. He has achieved board certification in the specialty of Facial Plastic Surgery by the American Osteopathic Association. Board certification is a rigorous process. Doctors must show proficiency with diagnosis and the development of treatment plans, as well as demonstrate superior skills in facial plastic surgery. The demanding examination process includes both a written and oral component. To maintain certification, physicians must meet stringent continuing education and retesting requirements, with routine Practice Performance Assessments. Board certified surgeons are also expected to maintain the highest standards of practice within their specialty areas. Dr. McGinniss holds an undergraduate degree from Ohio Wesleyan University. He received his Doctor of Osteopathic Medicine degree from Michigan State University, where he completed his residency in Otolaryngology and Facial Plastic Surgery. Additionally, Dr. McGinniss served as a Flight Surgeon in the U.S. Air Force for the 354th Fighter Squadron at Davis Monthan Airforce Base. He recently completed a Fellowship in Facial Plastic Surgery under the supervision of Ross A. Clevens, MD, FACS, founder of Clevens Face and Body Specialists. As a member of the practice’s award-winning surgical team, Dr. McGinniss specializes in cosmetic and reconstructive facial plastic surgery and complete skin cancer care. Clevens Face and Body Specialists is a multi-specialty plastic surgery group and medi-spa providing comprehensive patient care at offices in Melbourne, Merritt Island, and Vero Beach. Founded by Ivy League trained Facial Plastic Surgeon Ross A. Clevens, MD, FACS, the practice offers Cosmetic and Reconstructive Facial Plastic Surgery, Breast & Body Surgery, NeoGraft Permanent Hair Restoration for Men and Women, Injectables and Fillers, Laser Treatments, Laser Hair Removal, Skin Cancer Care, and Medical Grade Skin Care. Dr. Clevens is an avid educator, speaker, and writer. He most recently authored “Your Plastic Surgery Companion: A Consumer’s Guide to Facial Plastic Surgery.” Dr. Clevens also is well known for community giving, including establishing the nonprofit Face of Change to provide food and medical care locally and abroad. 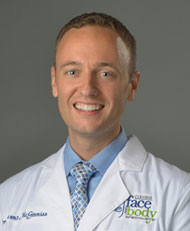 To learn more about Clevens Face and Body Specialists, call 321.727.3223 or visit http://www.drclevens.com.